Edward Luyken was born in 1950 and has been making experimental films on an almost annual basis since 1978, as well as sculpting and painting. He was brought up in a children’s home in Rotterdam from the age of ten and studied at the Rotterdam Visual Arts Academy. He has lived in Paris, New York and Tokyo. His latest run of short films regularly premiere at the Rotterdam International Film Festival. In 2000 it was Quaestor (2000, 14 mins); in 2001 it was Seascape (2000, 14 mins); in 2002 Tegenkracht (2002, 17 mins); in 2003 Dobra Voda (2003, 14 mins); and at the 2004 Rotterdam International Film Festival, as part of “The Mind’s Eye” program within the larger D-Light retrospective, his new film Mariaheim (2004, 14 mins) was shown with the much earlier Ten Past Six (1979, 7 mins). This ongoing ritualistic screening groove echoes the relentless nature of Luyken’s filmmaking practice and arts practice in general. Luyken commits to a diaristic recording of moods, gestures, sculptures and friends in his films reminiscent of early Mekas. 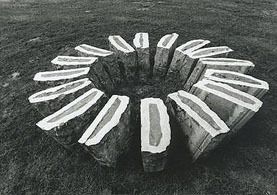 Over recent times, his stone sculptures have increasingly become the subject of his films, representing a true material centre for an arts practice embedded in daily life. Mariaheim played at Rotterdam 2004 with a live soundtrack consisting of Luyken playing the trombone, as is his tradition. Quaestor, Tegenkracht and Dobra Voda were some of the works encountered later in Luyken’s work-riddled flat after my renewal of an acquaintance, a connection first established in the mid ’80s, just prior to Luyken’s move with his partner Therese and his two young boys to Amsterdam from Rotterdam. I had first got to know Luyken at the time he was making Ten Past Six. His almost manic but decisive will to create art works that I became aware of at that time remains in the recent pieces. This will to create has been tempered by the events of his life, the places he has been able to work and to create. The range of strategies that he has developed to work with material has also grown and matured. This is a raw physical cinema. Its mixture of time-lapse, animation, pixilation, totems, toys and drawings suggest a kind of hyperactive feral Svankmajer. Luyken is always active, always moving in and between various modes of presentation, often bringing the gestures, actions, bodies and faces of himself and his participants and collaborators into his activities. These works have a pagan and alchemic flavour, and concern themselves with the metamorphosis of form and movement. The bustle documented is reflexive, reactive to the moment and clearly imbued with a larger, body-centred strategy of negotiating the world. In these films, even video flicker becomes substance. Luyken’s recent film, Mariaheim, splayed out on screen has been forged in the shadow of the debilitating effects of multiple sclerosis on his life partner, Therese Breuls, who recently passed away after 17 years of fighting the disease. These films (Mariaheim, Quaestor, Tegenkracht and Dobra Voda) live in relationship to this loss and can be read as the adventure and the negotiation of this leaving. Therese is continually referred back to, in her filmic presence as puppet, face and body, and through the rocks figuring as altar, bed, casket and monumental vessel. This spiritual presence looks on to witness the acts and will of a man. In watching this work I sensed a man rising out of a long period of toil and often-celebratory mourning. This is an artist who continues to negotiate the circumstances that make his art practice possible, often dealing with financially and personally challenging but affirming circumstances. So here is a quick descriptive run-through of some of Luyken’s films; hopefully in the same sampling spirit in which they were constructed. Quaestor (2000) begins and ends with television footage of Luyken and his musical accomplices performing at the Rotterdam Film Festival. Close-ups of the surface of flowing and bubbling water, a man jumping in and out of the river, rocks that look like loaves of bread. In a cemetery we read on a stone “Let me lighten your sorrow and chase the demons away”. Later, there is a connection made between the water-Konijn (water rabbit) and the kayak (an ever-present vehicle in all the films). The water-Konijn is one of the five types of rabbits in Chinese astrology and represents a strong sense of justice and fairness. We see a rocky water garden, a kind of pagan memorial. We see images of a panther and a tiger, in close-up pacing their cages. Their energy is embedded in the stones. 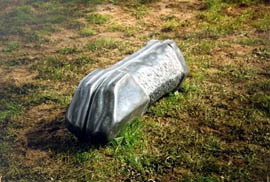 Seascape (2000) focuses on a large 23-piece hard granite sculpture Luyken had been working on for nine years as an unconscious farewell to Therese. It begins with the city outline (skyscrapers) and an expressive upbeat soundtrack. 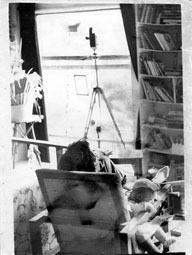 The kayak as object is presented in his Amsterdam container studio with a uniquely shaped bow and stern. There are images out on the water in the kayak, drawings strewn around the flat. There is an animated doll overlooking a small version of the 23-piece sculpture. Real time images are often cut by short segments of animation that Luyken has been working on. A series of abstract black and white paintings are cycled through to look like splashing water. Luyken’s flat is presented with its scavenged material – stones, photos – representing a kind of self-contained environment or eco-system. Always, we come back to the kayak on high seas. We are presented with a dance between two puppets and there is always the water, and the kayak. Tegenkracht / Counterforce (2002) begins with video footage of the Luyken boys digging up the large stone sculpture which had been placed in a friend’s garden for safekeeping. In the shadow they are watched by the two puppet figures introduced in Seascape. The sound is ambient and suggests an emotional state. The film ends with film footage (not video) of the digging up of this same sculpture. There is also a sequence of what looks like Therese Breuls’ carers or friends performing a slow, considered, immobile dance on a trolley in the claustrophobic spaces of Therese’s flat which ends with Therese herself being mechanically lifted out of her bed. The film also contains a memoriam to the work of performance artist Stuart Sherman. There is the ritual of a few rocks in especially made boxes being taken out to sea. There is a series of radiating rock sculptures in the shape of flower petals. Dobra Voda (2003). As well as meaning “the good water”, “debra voda” is also a Russian brand of vodka and the bottle appears as part of a puppet’s torso. The film begins with rocks stacked at the front of a barge and continues with images in a gallery, Luyken’s rock covered lounge, the putting of stones in patterns, and flickering images of Therese, as well as an image of her body in a funeral casket. The repetitive sound of water and bells is like incense that continually purifies the viewing of the film. Dobra Voda ends with a death ritual. An animated doll lies on a rock sculpture and is tied down. I seem to recall a ritual performed by some “primitive” cultures where the dead body of a loved one is placed on a wooden raft, set alight and pushed out to sea. Here the vessel is pushed out into the black square of the emptied film frame which itself is suggestive of the heavy dark sheen of the rock sculpture on which the avatar rests. Mariaheim (2004). The video image of the gutting of a hare is offered up. A series of stones are presented on a podium and rotated through. And, as in all the films, there is the activity of puppets and the speeded up activity of faces and friends busy in the landscape and within their own spaces. In this film the sound has an anticipatory, maybe foreboding edge with more shifts in energy than in the previous films. Luyken shaves, his adult son climbs a building. There is a kitchen sequence of fruit having been gathered, washed and turned into jam. 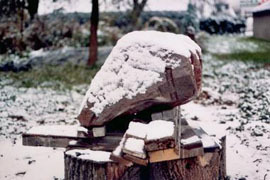 Various sculptures are displayed, embedded in snow, encountered in parks and within rural scenes. The body is processed for consumption and renewal. Landscapes from inside the flat mix with images from the outside. Should such a series of films with its recurring themes and collection strategies be seen as one feature length work? Luyken has made a number of longer films on 16mm among them White Line Fever (1978, 90 mins), Tikal Temple (1979, 80 mins), Dutch Headline Builders (1982, 90 mins) and Watermill Triangle (1982, 90 mins). These were made during periods when funds were more available. The design of these annual 14-minute diary entries facilitates multiple readings and viewings that reveal the layered connections between them. When viewed together, more can be read into them. They talk to each other and they are, of course, linked by a physical life lived. Their singular lengths have been at least partially determined by the politics of annual exhibition opportunities. Such a move from short to feature length is not a new strategy. Amerika (1983) by Al Razutis and Mike Hoolboom’s Panic Bodies (1999) were both constructed out of a series of stand alone shorter works. The following is an interview that took place in Luyken’s flat in Amsterdam after the 2004 Rotterdam International Film Festival had concluded. The interview was conducted in English. Dirk de Bruyn: I’ve just had a look at a series of your films: Ten Past Six, Quaestor, Seascape, Tegenkracht, Dobra Voda, and Mariaheim. I understand that you’ve got into this situation where you have made one film a year now for quite a long time. Edward Luyken: That’s correct, it’s short films, every year, and it’s on 16mm, not 35mm, and I’m glad that I am able to make and show these films as well. I usually show them two times a year: the first time is in Rotterdam in January and the second, six or seven months later, is in Utrecht. DdB: So this is almost like a ritual that you’ve been doing for how long now? EL: I never planned it like this but in fact I can’t deny that it is, of course, a ritual. Rotterdam is like a new year, for me. It’s then the New Year starts; so we are celebrating right now the passing of the old year into the new. DdB: Even though you’ve been making films for a long time it’s no longer really your primary artistic practice, is it? Over the last 20 years, since I first met you, you’ve become more of a sculptor. EL: That’s right. It’s incredible that we meet again after 20 years. Every year I make a new film, and I must say the last time I was in Australia, for some reason, I experienced this sort of breakpoint in my career. If you can call it a career. Because when I was in Australia, I remember very well that I was not happy any more with the stuff I was doing in the art world. First Paris and then New York and then Paris again, because that used to be my base from 1975 till almost 1980. It was figurative painting; that was the point. It was an enormous fight to stop the figurative way of thinking, working and materialising, and to change to an abstract way of thinking and working. And when we were going across the country in Australia in 1982, for some reason, in a symbolic way, it was the first time that I felt totally different and away from everything. I had been in Tokyo the year before, 1981, but ’82 was Australia, for all of us: my late wife and mother of my two sons who are now 25 and 23 but who were then three and two, very small. I just saw them yesterday again at that age on a Super 8 film, which I projected for myself last night because I couldn’t go to the Festival party because I didn’t have the money for gasoline. It was a film of a trip on a boat, which goes around Manhattan. In that film I saw the boys at the age they roughly were whilst we were in Australia. DdB: So the time in Australia was a breakpoint in your career? EL: Sorry, I’m always going in a roundabout way of saying things, but that’s the way I communicate. That’s also the way I write columns and how I’ve read stories every week on community radio for the last two years. So sometimes if you have a question and if I give an answer I will end up at a totally different place. Just bring me back on track (laughs). DdB: Maybe that is also how your films are constructed. There is that way of working that comes out through the films that’s all about now and the immediacy of things. Each piece also has its own mood that comes out, that somehow reflects that moment in time. EL: It’s film that has a very important kind of magic about it that I still don’t understand by the way, or why I do it. I wish I did. Jesus then I could do so much more with the phenomenon. You know ci-ne-ma, cam-er-a, or celluloid or an image. It could be digital, as well. I found out later when I tried to analyse you know this behaviour of making a film every year, that especially since I’ve been making stones, or stone sculptures, that it was a way of showing my work. OK, now I have a gallery, but that’s only very recent, only three or four months or so. All those previous years, I didn’t have a gallery. I didn’t have a place to show my stones, so what did I do? Make a film of the stones in order to show the work. So at least it was a podium to show the stones. But of course there two totally different things. If you go to a gallery, you can look at a stone, you can look around, and maybe two days later you can come back with somebody else or alone. With a film that’s not possible. Let’s say in a film of 14 or ten minutes duration, you’ll be able to see the most important stone among other stones maybe at the most for 40 seconds to one and half minutes, which is actually nothing, given 40 years work. I mean it’s crazy. It is not the right way to expose your stones but I think that was probably one of the motivations from years ago. 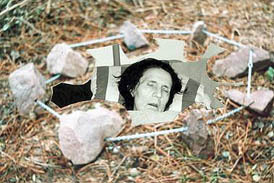 DdB: You showed me some photos of the stones before. I felt unsatisfied; I needed to touch and and move them, feel their weight and all that. Being next to them seemed important. But still, the films showed a way of working and the relationship of the stones to other things in your life. But to backtrack: what happened in the outback of Australia? EL: Yes, it means something to me. I don’t know what exactly. I liked the countryside. I wasn’t a sculptor at the time. I would have gone crazy because I cannot imagine that continent not having stones, they must have stones. EL: I mean they must have many stones. DdB: The other thing is when you came back to Holland, you actually moved from Rotterdam to Amsterdam. EL: Well at first we returned to Rotterdam after Australia and I remember very well that the first thing I did when I was back in Rotterdam was I went to my studio alone. I kept in contact with Therese and the children, who were in Capelle just outside of Rotterdam, by phone. I wanted and needed to be alone. I remember I prepared this huge canvas and I painted a big huge kangaroo, and for some reason, since it wasn’t the figurative way I used to paint, I guess, I thought it was a good piece. It doesn’t exist anymore, only the Polaroid. Anyway I was making a soundtrack for one of my feature films, Watermill Triangle (1982, 90 mins), which used groups of actors. Each group had two actors, and so I had to deal with 34 actors, but at different times, you know, and a painting to go with it and whatever, performers, you name it. I felt through this process, more and more, the need to change my life by means of going in a totally different direction and, if possible, a more abstract way of thinking and working. But to come back to Rotterdam, and to this painting of the kangaroo … I called my friend George, who was living on Long Island in New York, and said “yeah, I have to think about the soundtrack of a feature film which I just made and is it OK if I come over?” He says, “Of course you’re welcome blah blah blah”. I got a ticket and three days later I went alone to New York City and Long Island. I then sat for two and half days behind a piano with good stuff to record sound. George himself used to be a piano teacher. But anyway I was in New York City and had this need to show everyone this kangaroo because there was definitely some sort of a change coming up. I think that I was aware of this unconsciously and so I went back to Holland only a few days later… While I was in New York I went to the opening of an exhibition by a Portuguese painter. I had met him before in Amsterdam, and I was glad to see him again. It just so happened that a few days after I’d returned to Holland he called me and said he had a space in Amsterdam I could have. And that was the space, which you saw in 1983. There it all began, the sculptures, I was chopping and using a lot of wood, working in metal, working in three dimensions rather than two. DdB: Even those long wooden pieces, they’re almost like a strip of film in terms of their length. And there’s this repetition along them. EL: The tree was 8m x 70cm. Yes, that’s what I made in 1992. DdB: That was later, wasn’t it? EL: It was. I had been filming it by the way, how they moved the tree from the village up to the hill. It’s on the hill that I was going to work on the tree. They first asked me if it was OK if they chopped the tree into pieces. I said “Oh no, please don’t you know I need it as one piece” and then they took two tractors, one was going forward, the other backward and the tree in between. That is what I filmed real fast. It was in black and white by the way. I shot a lot of raw material. At that time I could shoot a lot of stock because I bought a lot of film material for almost nothing in Chechnya. It was black and white. DdB: Did you get it processed over there? EL: And that is a scene in the film, it’s called Turning Point (1992, 21 mins, 16mm). “Turning Point” is the name of the stones in a circle you might have seen in the documentary, which I also made in Chechnya at another location in ’91. Chechnya and Austria were the places, all of a sudden, for my feeling. I could work well. Let’s say my feeling was a hundred times bigger than in Holland. DdB: So you started working in sculpture in Amsterdam. Another big thread running through your life from then on and which comes through in a lot of the films is the fact that your partner, Therese Breuls, was suffering from multiple sclerosis and was becoming more and more incapacitated over time. And to me it seems that that had a big influence on the subject matter in your films. EL: Very possible, very much, but it’s not for me to make a judgement on. I couldn’t analyse it, it’s too emotional and it’s still too close, you know. It is for others to look at the material and put the pieces together if it’s interesting enough. No, she was a great influence for me. DdB: Of course. In the films there’s this incredible movement all the time, there’s this energy of going from abstract to sort of re-enactments and to showing the sculptures in different situations. How did you go about constructing those films? EL: First of all, I have to say, it sounds like a paradox, but I think it’s important to speak the truth, that filmmaking itself is an extremely nervous activity. If I am working with stones, as a human being I feel much better, really. I’m very impatient with the camera. I should love the camera much more than I actually do, I should give it more attention. I don’t know. I mean the stress, the power, required to concentrate on filming, to work with the camera, the tripod and light, and appointments with people, that’s stress I think. Then there is the joy and pleasure, which I get with minerals and the stones, like the six stones here I took out of the Waal river east of Amsterdam, close to Germany. There’s this huge bridge and under the bridge the water level was quite low this summer and so I was able to pick stones out of the river and then put them in the car and then the next day right away start working on them. From the moment you start working on them, they become as beautiful as a jewel and they give so much power. It’s like it’s without criticism. Every time when one stone is finished we put it on the table. I look at it with this woman sculptor. We put the stone on the kitchen table in the evening and she understands what I’m doing; the only thing we talk about is stones, and other stories which come about because of looking at that particular stone that evening. DdB: I think that also comes through with your filmmaking, it’s very direct, it’s always about now, it’s very immediate. EL: Yes, first take is the right take. Absolutely. I can’t afford to shoot anything twice. That’s my thing, which I like of course, but it’s a love-hate relationship because it takes away all the energy that I otherwise could use for the stones. I love it, of course, when everything is working and the light comes on, and there is this illusion and it’s beautiful. More interesting than the video thing. I’m also using video. But film, I still have the impression that I can understand it, to a certain point because I can take it in my hands and put it in a light box and look at it and feel it. DdB: There was a time too when you were also writing directly on the film, drawing and colouring. EL: I have a few films, the black and white stuff, Turning Point, Blood and Fire (1992, 10 mins), there must be a few others but I can’t remember the titles right now. Being black and white, I really thought they needed colour. The only thing I could do was to fill it in which was a lot of work of course, but it improved the film. DdB: The first film of yours I saw, even though it’s the last film you made, was Mariaheim, apparently named after the farmhouse in which you worked on your stones. There’s a certain energy and materiality about the way you were working; it was all about movement and its impact on things. EL: Emotionally, I cannot think and talk about it that much. I wish I could. I remember that, emotionally, it was a very overactive year. I can’t avoid it; I hate to talk about it. I was involved in a love affair and we were breaking up slowly, step by step, piece by piece. In order to defend myself, to survive, I started travelling around Holland. The Filmbank, who I am grateful to, approached me to tour Tegenkracht, which I showed in nine cities. More than anything, that was the start of breaking away from Amsterdam. I had a chance to travel with the film, to which I had to play live, to blow the trombone. It brought me out. I could never have done that before; I would not have had that strength. It brought me onto the highway. I could not do that in the previous years because Therese was still alive and she needed my attention everyday. There wasn’t even the idea of moving out of town. DdB: You were talking about why you had this energy in the films. After Therese died you had this energy to go on the road. EL: Yes, so I was on the road with the film, my trombone and my canoe, which was on top of the car. DdB: We can see those images in the films. EL: What I always wanted to do but never could was to visit friends who were living outside of Amsterdam and Rotterdam, away from the cities on farms and that sort of thing, and so because of this tour, organised by the Filmbank, I started visiting those people and well for some reason people were acting very positively, all of them, towards the idea that I wanted to work at different places, you know with my stones. That’s what I started doing. DdB: It’s all outside Amsterdam? DdB: Now the other thing you mentioned of course is this idea of accompaniment over time. At the Festival, you played the trombone during Mariaheim. You’ve been working with this for quite a while. It did not take over the film. EL: I know what is coming after each image and then I think, oh no, not that and that and then it’s like I see a person on the screen and I want to give them energy and I want to say HELLO. I’m just blowing the horn (laughs). It’s very primitive you know but it gives me joy. DdB: I don’t think the rhythm of it, where you place it and the timing of it is primitive. I think it can be subtle and very considered. EL: Every time the performances are different. No better or worse but a bit different and hopefully as harmonious as well. DdB: You’ve got other instruments as well haven’t you, not only the trombone. EL: I started with percussion in 1987. Hubert Bals was still the director of the Festival in Rotterdam whom I had met before, in 1977. In 1978, he came to Paris one night in the middle of the night. I think at two o’clock or something like that. I showed him the films and then he said come to Rotterdam, and that’s what I did at that time for the first time. In 1987 he asked me if I could not do the same thing that I was doing with him – namely showing the film and sitting beside him, talking about the film while it was on. He asked if I would like to do that for an audience with a microphone and give comments on what I was doing. I mean what was happening in the film. DdB: I can appreciate that because when we looked at some of the films on video you went back to such references like this was this and these are these people. EL: Yes, but I must say that it didn’t happen. For some reason I couldn’t do it. Instead of that I brought some steel sculptures, you know big ones hanging in a frame. I think about eight or nine in a row and I was playing them with the sticks. EL: And in that particular year I had seven films. That was the first time that I had seven films in a row one-hour non-stop. I had to repeat the playing three times for the three screenings. I would play non-stop on the metal with the sticks or with my fingertips, and then of course every piece of metal had a mike attached to it into a mix table into an amplifier. You only had to touch it a little bit and very softly you could already hear through the boxes in the cinema this vroom chickachicka vroom chickchick, that was your hand scratching and it’s beautiful, actually I should do it again. DdB: You’ve said that you don’t preconceive your films before putting them together, but I want to say that each one does convey a different mood and idea. EL: I don’t know what to say. I am happy with the soundtrack of the last film Mariaheim, and of course the shots of the stones, in particular the red stone. That stone is not finished by the way, being red granite it was transported a few months ago from East Germany. But it’s actually a stone from Sweden, which was once, I don’t know how many years ago, maybe a million years with the ice. DdB: Oh on a glacier. EL: I mean that’s all I know about Mariaheim is that it was again emotionally a tough year but this red stone saved me. It saved me because it was parked in the middle between Germany and Amsterdam at a friend’s place and I wasn’t sure if I was going to move the stone to Amsterdam or the Province of Limburg which is close to Germany, and well I finally had to consolidate a very important decision about the relationship and so it was the green light for this stone to be moved. It weighed 400 or 450 kilograms; it was moved to the east, allowing me to start work on it and so to forget all emotional things and put everything into the stone. My late wife always said, if you’re happy or you’re sad, especially if you’re sad, start working. Or if you’re terribly in love for instance, even then, put it in a stone, put in a stone, put it in a stone. So that is what I’ve been learning from her you know, that you can put everything in a stone. DdB: It sounds like you’re doing with the stone more consciously what seems to happen with the film. I think you’ve also been putting them in the films as well, and depending on what year you’re in there’s a different mood that comes through. Therese passing away, you can sort of see that in one of the films that there is this real mourning. And it’s not a sadness but it’s like a purification and a passing on, and it seems very healthy the way you are able to put all these things into the material of the film. They are things that are important to you and are preoccupying you in your everyday life. DdB: I don’t know what you can say about that (laughs). EL: No no. I can start to philosophise about it (laughs). DdB: Well another question. I’m drawing you away from the stones and back into the film. You’re doing all this work with these stones but then you’re having this ongoing documentation happening all the time too. So is it a question of keeping your camera with you and all of a sudden thinking, I’ve got to do something here. You do some sort of filming and at the end of the year you bring it all together in some sort of form. Is this what happens? How does it happen? EL: Once in a while, if I’m lazy, I’ll tape it on video and if I’m more focused or I’m sure I have to take the film camera then of course I’ll take the film camera. But many times I’m lazy and I only carry a video camera, and I later on dub onto 16mm, straight from the screen. Which means you get those lines, but I couldn’t do it otherwise. That’s what I’ve been doing for many years now and it’s like you can’t show the proper image. But you can show a photocopy, or a photocopy of a photocopy, and it gives the same information which you want to pass on. DdB: Sure, but I think that sort of directness about it has become sort of a signature. It doesn’t matter that there’s video lines. It’s about a certain directness isn’t it? EL: A hare. It would have been nice if I’d had a 16mm camera because it was so beautiful. I didn’t have the film camera with me, but I had the video, so I shot it on the video right away. I had to make sure I had that image because that was one of the farms where I left the stone and that’s what I’ve been doing till recently. I never sold anything, I put it in the gardens of friends (laughs). When I come to think about it, I don’t think it’s a very good idea, but at least you’ve got to have some idea, you have to start somewhere and that might be the next film. I would like to do something with those gardens where I have sculptures, which is impossible to put in my own place because it takes too much space. DdB: That’d be a way of bringing all the sculptures back together again. EL: Yes and fortunately I don’t have to move them then (both laugh). I was always glad I had friends with gardens. The film probably will be called Stone Back. It’s almost like a human figure. The back of stone and back to stone. A stone on your back. DdB: What about stone beck, as in mouth and talking about the stone? DdB: At some point at the end of the year, or whatever, you have to put it all together into one piece, how does that happen? EL: I shoot one roll and the second then the third and then the fourth and the fifth throughout the year. EL: I just start when the stone is taken out of the river. It’s a reflection of activities in the year and I don’t have to think that much about montage. So just click number one to two and two to three etc and make sure you’re prepared mentally first of all. In order to do sound and light exactly the way you want it. DdB: Do you think of it as a notebook or diary? EL: It is a diary even if I don’t want it to be. It’s no more than that in fact. DdB: You can say that but at the same time you know there is a lot more you can read into it; each of them is like a song as well. When they add up together, all these images equal a lot more than all by themselves. EL: I like that word song. I mean the word diary, well maybe it is a diary but for some reason I’m not so happy with that name. DdB: It gets away from what Hubert Bals was asking you to do. EL: Which I didn’t do. DdB: You stayed in a space which is more like a song, some sort of abstraction of something more immediate. EL: Instead of talking, I started making films. I wanted to envelop the space with a life presence and a direct reflection from the audience to me and back if possible. I couldn’t think of anything else. Being there and having fun making music while watching my own films, that works. But later on I started talking by the way. EL: But many many years later, I mean. DdB: And what sort of things did you talk about then? EL: About the film, about what I saw. Like, oh this is a stone which I picked up at that village at the German border, and then I had to change immediately to another story because we got another image. Usually I couldn’t finish the stories because the images were changing too fast. DdB: What do you think of the idea of not showing one film a year but collecting maybe five or six years together and showing it as a piece? EL: I myself never thought of that, you’re the first person. In principle I don’t think it’s a bad idea, it can be done. That means, for instance, that if you have six different films I have to also change the accompanying instruments during the screening. EL: So we get different instruments, maybe it depends on the film. Last year, for instance, I did performances, maybe six or so altogether, with not only the trombone but trombone and a trumpet. This time I felt more comfortable with just a trombone and I think that was a good idea because the film is only 14 minutes and time goes so fast that if you do the trombone in a nice way, you’ve got more than enough. DdB: In terms of the sound of the films we saw they all have different soundtracks but they’re all constant nodal pieces. You set something up like bells or water falling or sounds of sea and the piece keeps moving through that. It’s like a constant, a standing wave. EL: I like to stay onto that, so that you have an atmosphere which is always there. That particular atmosphere doesn’t change that much. Mariaheim was the first time I used samples, which interests me now. I’m not finished with that. I would like to buy a machine like that for myself as well because I borrowed the one I created that soundtrack on from a friend. DdB: Another thing which runs through a lot of the films is the way you’ve done the titles, the letters from the titles. EL: They’re clay letters. I figured instead of every time, every year when you have a new film to make and a new title to paint it or whatever, I thought it would be a lot better to have the whole alphabet and a few extras for the a’s and the e’s and o’s etc, so that I can always make a text with the clay letters. I can put them on the floor and shoot immediately. DdB: What I like about those letters is that they are material that bring you back to the stones. EL: They’re the same family, they’re the earth. It’s the earth. Somebody else said that to me about the titles. DdB: Another film that was in the program was Ten Past Six, and that was made in 1979. Comparing it to Mariaheim there were things that had changed but others had remained. There was still the inquisitiveness, the vitality, this movement, this working with material, you as a younger artist restless, continually being inventive. EL: You mean the same sort of energy, but in a different way? DdB: It was a younger form of that energy but it was there. It was this ongoing relentlessness. You wouldn’t stop and every time you would make something you would destroy it and then you would make something else again and reuse it and wipe the slate clean and start again. You’re also now doing that with each new film. There is a renewal there, and a wiping of the slate clean for the next year. I suppose that’s not really a question is it? EL: No it’s a reflection, you’re telling me that’s what you saw. For myself, I think in different terms of course. DdB: Of course. So do you think there’s an energy that you had when you first started that’s still there or how has that energy, in terms of how you work, changed over the years? EL: I don’t know if it did change, but I think of the very first film I shot on Super 8 and then blew up to 16mm, Zero One (1978, 5 mins). This was an animation film of three thousand small drawings that also had a sort of a rhythm, maybe that’s what it is that I’m now referring back to, back to the word SONG. DdB: So let us finish the interview with that song then. Special thanks to Jan Lacey for her work on the transcriptions.